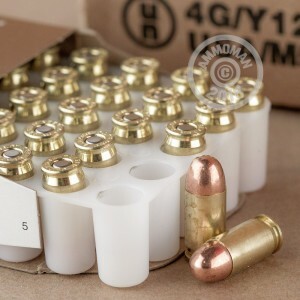 Grab this economical range ammunition in a 1,000 round case (20 boxes with 50 rounds each) for practice with your Walther PP, Ruger LCP, Bersa Thunder, Colt Mustang, or other .380 ACP carry pistol. 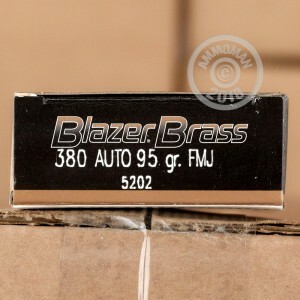 Made by renowned Idaho ammo manufacturer CCI, this Blazer Brass ammo uses non-corrosive Boxer primers, brass cases, and 95 grain total metal jacket bullets. Total metal jacket, or TMJ, bullets cover the base of the bullet and reduce overall lead exposure, making them great for indoor and outdoor ranges alike. Blazer Brass ammo is a popular choice among shooters due to its combination of low cost, consistent quality, and extra lead protection. 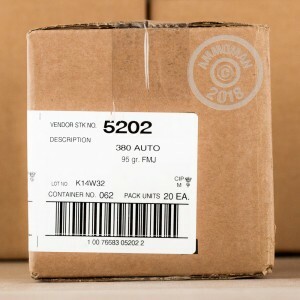 Buy more than $99 worth of ammo from AmmoMan.com and get free shipping to your doorstep!